Now beautifully repackaged in convenient paperback format, Indian for Everyone is the third book by Anupy Singla, former broadcast journalist turned foodie blogger turned best-selling author. This book is by far Singla's most stunning and comprehensive offering yet. Singla is America's favorite authority on Indian home cooking, and her expertise with delicious, healthful recipes and her commitment to simple family-style cooking has endeared her to fans the world over. If readers are going to choose an Indian cookbook to own, they will find none better than this one. 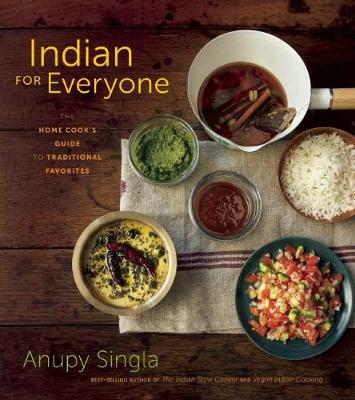 This new book expands on Singla's previous titles, the best-selling Indian Slow Cooker and Vegan Indian Cooking, and opens up the true simplicity and flavor of Indian food for anyone, regardless of dietary restrictions, level of expertise, and familiarity with Indian food. Singla has chosen the most popular dishes in Indian cooking and, unlike other Indian cookbooks, embedded different preparation styles and ingredients into every recipe. Included are quick-and-easy adaptations for making a meal vegetarian, vegan, or gluten-free, as well as alternative methods for preparing a recipe in a slow cooker instead of on the stove-top. This sort of unique flexibility makes Indian for Everyone a book that is perfect for anyone. This book is for Indian food lovers who live for the cuisine's diversity, as Singla includes both Punjabi recipes and many other regional styles from across India. This book is also for skeptics who claim to "hate the taste of curry" or feel "Indian food is too spicy." They will learn how traditional Indian cooking eschews curry powder or how any recipe can be made as mild as desired. This book is for beginners, offering step-by-step instructions on spices and techniques. This book is for seasoned Indian cooks as a reference point for their favorite dishes, including little-known instructions and standard cook times their mothers and grandmothers never wrote down. This is for meat eaters who can't resist tandoori chicken, minced lamb, and fish. This is for vegan and vegetarians who want real and tested alternatives to meat recipes that celebrates whole food choices, rather than just making them a sidebar. This is for healthy eaters who want to know if you can bake a samosa rather than fry it, if you can substitute quinoa for rice, and if there are gluten-free Indian bread options. This is for folks with allergies and dietary preferences. This is for Indian food lovers who eat delicious restaurant meals and want to replicate them at home. There is no Indian cookbook available that is more inclusive, more welcoming, and more adaptable to any given reader's tastes, across all its 125 recipes. The stories behind these recipes are richly detailed and personal, and readers will see how traditional Indian cooking helped connect Singla and her daughters to their cultural heritage, while also connecting American families to new, healthy eating choices. Whether you are a vegan or meat lover, gluten-free or pro-naan, an experienced chef or an amateur home cook, Singla appreciates that most of us are looking for great taste, nutritious ingredients, and easy preparation. Her books have ushered Indian spices and cooking into homes across the country. More than the next great Indian cookbook, this is the next great American cookbook that will be a staple of every family's collection.